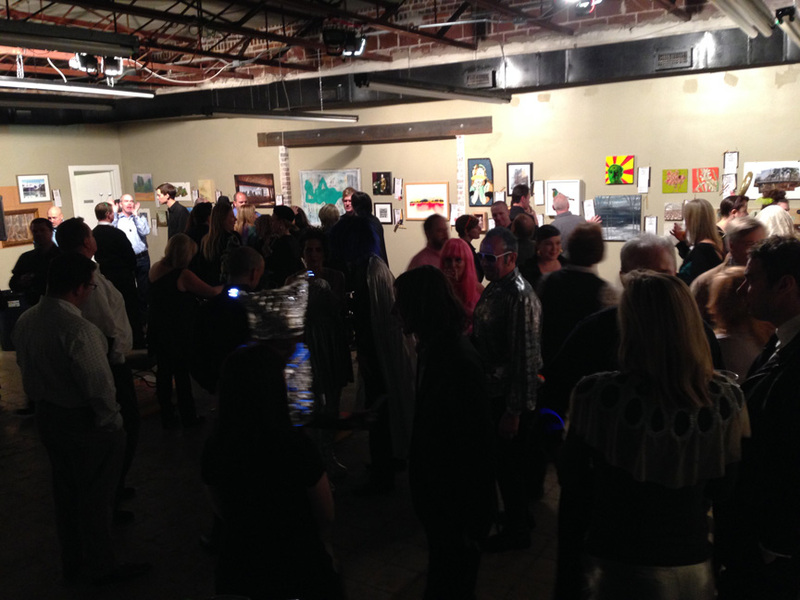 Magic City Art Connection’s (MCAC) Intergalactic Art Bash blasted off to the future on February 22! 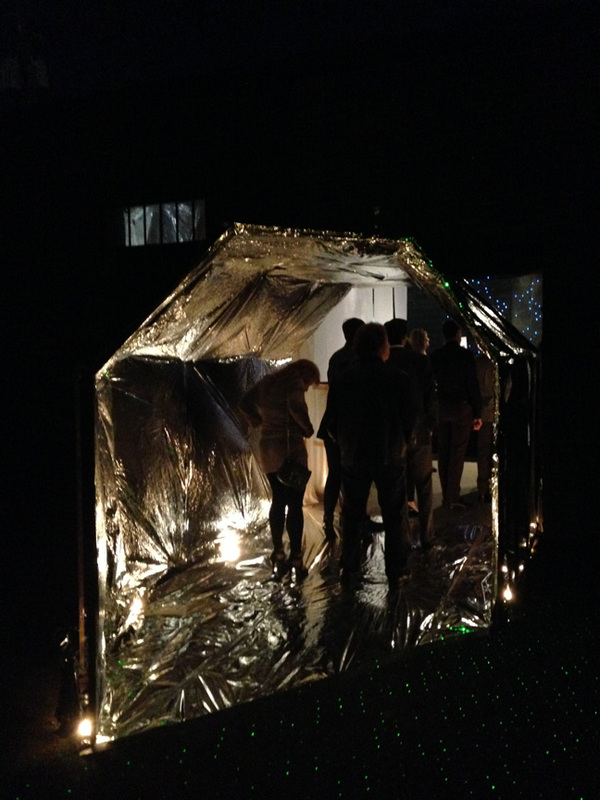 The silver mylar tunnel entrance to Intergalactic’s spaceship shimmered and glowed against the dark night sky as guests arrived at Art Bash’s “another cool Birmingham space” on 3rd Avenue South, formerly NorDys Gallery. 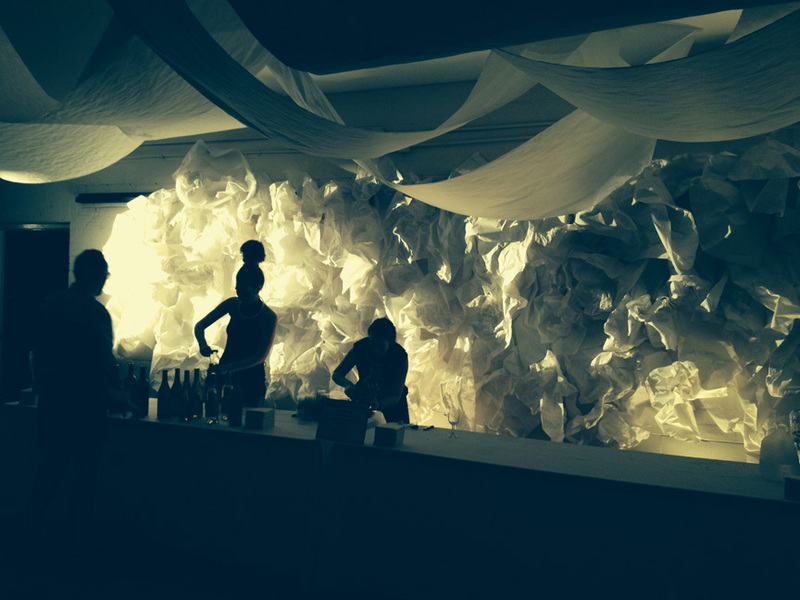 After checking in for their journey to the future, they were guided to the art salon by way of an all-white bar room with avante garde wall to ceiling paper installation. Mixologist Clair McLafferty of Octane greeted partygoers there with a blue, high proof Intergalactic signature cocktail as they began scanning the art walls for that favorite work to take home. One hundred pieces from participating festival artists were on display at Art Bash, with more than half going to the $100 ticket holders through a fun lottery game. What party offers a work of art with entry? Art Bash does! The Space Walkers who purchased the $50 ticket joined in the action to bid their hearts out on the remaining works not selected by the Lottery ticketholder trumpers. The promise of a great work of art is not the only draw at Art Bash. The uber talented Omni Studio photography team of Liesa Cole & Tony Rodio took guests on a space odyssey at their exclusive and highly coveted Art Bash guest portrait series. A lit, curving portal was the only way to reach their metallic mercury set. Once there, the excitement and anticipation was palpable as models anxiously awaited their turn in the spotlight for the theme-inspired photos. They are always amazing, and a very unique opportunity for party patrons to be captured on film by this talented and award winning duo. This seven year partnership with MCAC has created an amazing series of unrivaled images exclusive to Art Bash. And this year’s portraits were no exception. They were epic! And it’s always fun seeing the creativity that comes out in patron’s Art Bash looks. Guests very much enjoy dressing up for each year’s theme, which makes the Omni Studio portraits even more special. For those less adventurous with attire, Art Bash secured some fantastic props of the future from Hunter Cressall Professional HD Media to ratchet up people’s look for the Intergalactic theme. Plus, stylist Lindsay Garrett was on board to embellish people’s future faces with her artistic touch using cool, modern airbrushed designs. 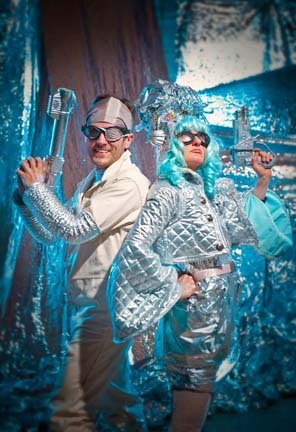 Intergalactic costumes ran the gamut and included homages to some of the most popular sci-fi movies and tv series, but silver, metallic, and luminescence won the day. To view all of the 2014 Intergalactic guest portraits, click here. “The space transformation is one of the fun discoveries for Art Bash attendees each year” says Alex Kunzman, assistant director of the festival and Art Bash producer. He collaborated with Christophe Nicolet on the design of the former NorDys Gallery space while Katie & John Gaiser, A Married Couple were back to transport guests to the future with sound and projections. 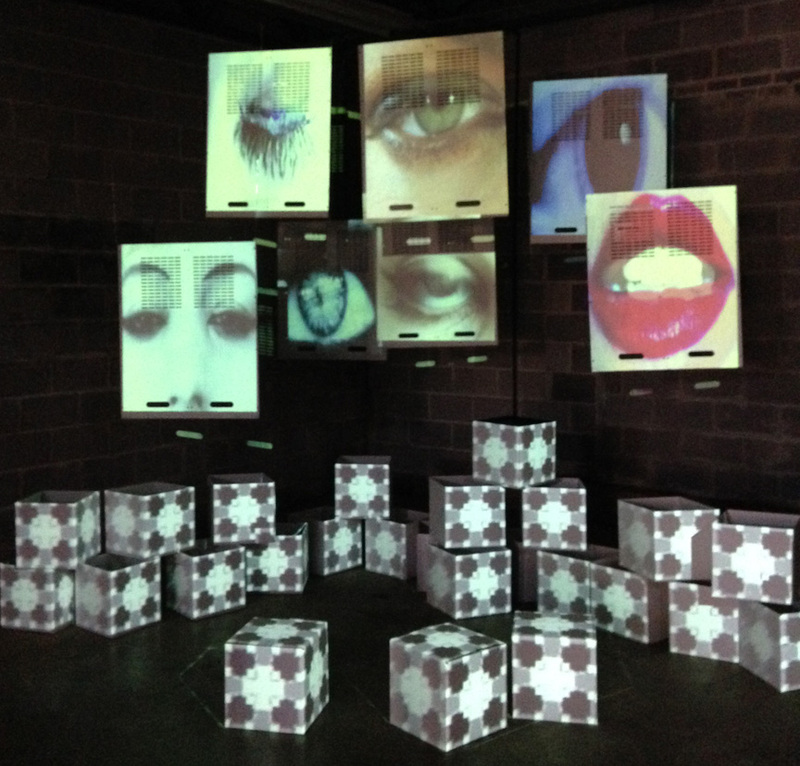 Their digital soundtrack for the evening was set against the backdrop of a special mapped video projection installation which anchored one of the spaces, visually engaging partygoers with random imagery of lit shapes, patterns, and even lips & eyes watching guests every move. It was colossal! 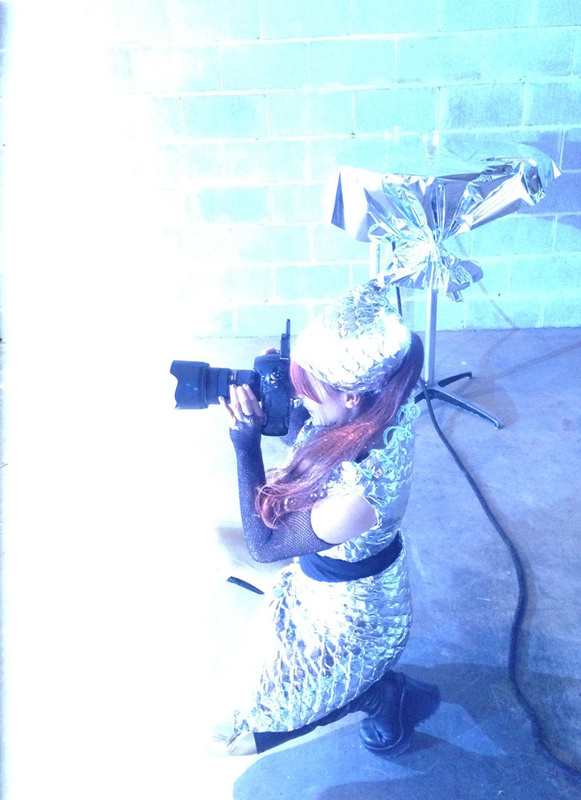 Watch “The Making of Intergalactic Art Bash 2014” >>> click here! To keep party futurists super charged for all of the art, music and photos, area caterers and chefs from MCAC’s popular food & wine tasting event, Corks & Chefs, prepared yummy bites to serve alongside complimentary wine from International Wines and craft beer from the new brewery on the block, Trim Tab Brewery. Art Bash’s culinary line-up included: grilled marinated shrimp, mac n’ cheese bites, havarti cheese with pecan caramel sauce, and cheesecake tort by B&A Warehouse, beef flautas by Cantina, pesto pasta with fried kale chips by Catering by LaNetta, assorted breads and dips by Chez Lulu and Continental Bakery, asiago pear and pimiento pepper jelly crostinis by Coretti Catering, roasted garlic hummus by John’s City Diner, chicken salad and pimiento cheese tea sandwiches by Nabeel’s Café & Market, and beef sliders by Yar-Tay. Proceeds from Art Bash help support art educational programming free for 1500 Birmingham city schools’ 4th graders attending MCAC’s Imagination Festival Friday program of interactive workshops and art experiences, plus hundreds more children over the 3 day contemporary art festival happening April 25-27 in Linn Park. When you look back at the sea of parties and fundraisers held each year, there are a handful of them that stand out. Magic City Art Connection’s Art Bash is among the standouts. It is super fun and always creatively fresh. Have you experienced Art Bash? You’ll have to wait til next year. But it’s definitely worth the wait!